When a clinician faces the difficult aesthetic challenge of the «black triangle» (more appropriately termed «loss of interdental papilla» or «reduced papilla height»), there are many available options. In this article we will first explore a cost effective, minimally traumatic, and predictable approach utilizing the Bioclear Diastema Closure Matrix. Then, we will then briefly review other traditional treatment modalities that are available to resolve this clinical dilemma. Although the focus of this article is papilla regeneration (Table 1), the featured case (Case 1) begins as a restorative treatment. This case (Figures 1 to 17) is selected to demonstrate an important principle: Any restorative procedure involving the interproximal area is a candidate for papilla regeneration. Because gingiva adapts to a wide range of shapes, clinicians today can create convenient interproximal shapes if the restorations are smooth and without a sharp-marginal ledge. Figures 1 to 3 demonstrate preoperative, immediate postoperative, and 6-week postoperative views. The patient originally presented with failing silicate restorations on the mesial of the maxillary right lateral incisor and the distal of the right central incisor. This 86-year-old patient requested that only the one interproximal area be treated and that the right canine-lateral area could be restored at a later time. Local anesthetic was administered and a rubber dam was placed. Figure 4 demonstrates modern nonretentive composite preparations with «infinity edge» margins. A new matrix design (Figure 5), the diastema closure matrix (Bioclear Matrix System) allows a smooth (yet aggressive) cervical curvature facilitating direct composite architectures that are extremely conducive to papilla regeneration. This is due to 2 inherent features. The first feature is the ability to forgo a traditional wedge and to use the papilla as a wedging force. A traditional wedge creates a flat cervical shape. Flat cervical shapes lack the static pressure needed to regenerate papillae (Figure 6). The second feature is a completely appropriate anatomic shape with exaggerated palatal, interproximal, and facial surfaces. This permits the clinician to simply remove the matrix after photopolymerization with little to no interproximal finishing. When the finish is extremely smooth and there is a lack of a gingival ledge, tissue health can be ideal, even with a very round embrasure form. This modern view of cervical curvature is in sharp contrast to the outdated notion that prosthetic and restorative embrasures should be flat. The case continues with both of the matrices in position (Figures 7 to 10). Total etch remains as the most robust method when bonding to large enamel areas, especially on uncut enamel (Figure 11)1. There is no need to stabilize the Bioclear matrices since they are designed to be self-stabilizing. Alternatively, a metal matrix can be utilized. However, it must first be hand burnished and annealed over an alcohol torch (not pictured). After placing the bonding agent, a small initial increment of flowable composite (Filtek Supreme Flowable restorative, 3M ESPE) is carefully injected in both teeth to fill this crucial cervical area (Figure 12; light-curing not shown in photos). Advanced magnification is of paramount importance for this step. Advanced magnification has become the standard for optimal soft-tissue response2. A flowable composite (rather than a paste composite) is preferred for this first increment. A paste composite would be nearly impossible to place in this «claustrophobic» area without voids, and without disturbing the matrices. Teeth are aggressively cleaned with rubber cup and flour of pumice. Interproximal areas are aggressively sprayed with high pressure sodium bicarbonate. If defective restorations are present, the affected areas are reprepared with «saucer preparations.» Infinity edge margins are created with coarse and fine diamonds. Bioclear Diastema closure matrices are placed. Total etch technique is utilized. Bonding resin is placed but not light-cured. Flowable composite is injected into the cervical area and then light-cured. Tooth separation is then created with a wedge or Interproximator. Bonding resin is placed followed with a small amount of flowable composite then followed with paste composite placement. Light-curing all 3 components of step 9 together. Sculpting and polishing. Final polish with new diamond impregnated polisher. High level magnification throughout the procedure is recommended. Note: For strict papilla regeneration, steps 3, 6, 7, and 8 are eliminated as the contact area of the affected teeth is already present. Once the cervical «hips» (or undercuts) are established with the flowable composite (Figures 13-14), a wedge or Interproximator (bioclearmatrix.com) (Figure 15) is placed to separate the teeth, just enough to compensate for the thickness of the Mylar. Otherwise, when the matrices are removed, the contact may be open. The use of the Interproximator is preferred because the soft body of this unique stabilizer/separator will not elicit pain from the palatal gingiva. Patient discomfort is a common problem that occurs when traditional wedges are placed near the palate, even in an anesthetized patient. Paste composite (Filtek Supreme Plus, 3M ESPE) is then placed on top of the previously placed initial layer of cured flowable composite. A small dollop of flowable composite (or bonding resin) can be used before placing the paste to «butter» the restoration in order to avoid seams or voids. Once the Interproximator and the matrices are removed, the teeth will spring back to establish a snug contact. This staged-wedging technique has been employed for some time by the masters in direct composite dentistry, but it is not well publicized. Figures 16 and 17 demonstrate the advantage of anatomically shaped matrices. Once the matrix is removed, the smooth and extremely durable surface is visible. The new goal of composite dentistry is to do little, or preferably no, interproximal finishing. That is because a «Mylar-composite finish» has no oxygen-inhibited layer. We have done microscopic study intraorally and on extracted teeth and discovered that an undisturbed interproximal Mylar finish stays mirror-smooth for years, even decades. Conversely, interproximal areas that the dentist «polished» are often gouged, rough, and stained. If one reviews the literature regarding papilla loss, Tarnow’s study3 has become a standard in calculation of crestal bone to contact area distance when predicting the stable papilla height. His study, based on 288 patients, showed that when the contact point was within 5.0 mm of the crestal bone, the papilla was present in 100% of samples. When the distance was 7.0 mm, the papilla was present in only 27% of samples. In reality, there are other important components that will skew Tarnow’s 5 mm rule in a favorable or unfavorable direction. There are many factors that determine papilla height. In addition to the distance from contact to interproximal crestal bone height, these include: root proximity, cervical profile (roundness of clinical crown), oral hygiene habits, adult orthodontic treatment, occlusion, host factors, previous trauma, and iatrogenic treatment mishaps. In a classic study, 2 papillae (per patient) were surgically excised from 16 dental student participants4. Of the 32 specimens, 22 papillae did not return to their original shape – a startling 69% attrition rate! Once a clinician becomes aware of the somewhat fragile yet flexible nature of the interdental papilla, the art of regeneration can become more commonplace. The act of squeezing a water balloon (Figure 18) mimics the adaptable nature of interdental gingiva. Figures 19 to 22 demonstrate an interesting case that was treated previously to close a diastema. As is typical with traditional direct composite techniques that rely on Mylar strip matrices, the previous composites (Figure 19) did not have adequate cervical curvature to close the gingival one half of the embrasure much less provide a «scaffold» for papilla regeneration. «In the sulcus» versus «on the gingiva»: The key in this new technique for diastema closure is to provide aggressive cervical curvature that begins subgingivally. Many traditional diastema treatments achieve closure with composite (or porcelain) that reaches mesiodistally; «on top» of the gingiva, or as in this case, in mid-tooth. These lower central incisors were retreated using a new Bioclear DC-UFI (Diastema Closure-Universal Flat Incisor) matrix, which has an ideal shape for lower incisors. The aggressive cervical curvature transitions to a fairly flat shape in the incisal two thirds of the matrix (Figure 20). The postoperative image demonstrates the significant difference that a specific Diastema closure matrix can provide. The regenerated papilla completes the space closure and the static tension of the gingiva against the interproximal tooth surfaces provides a youthful seal, eliminating bacterial colonization and debris accumulation (Figure 21, 22). The patient was extremely pleased with the result. Although at first glance the teeth appear somewhat bulky in the gingival one third, once the lower lip was allowed to drape normally against the teeth (not pictured), the aesthetic result was ideal. The highly polished composite surface (Jazz composite polishers, SS White) attracts less plaque than the previous large embrasure space, and actually felt smoother than her natural tooth surfaces. Natural interproximal embrasures are constructed with a wide range of cervical shapes and varying root proximities. Because gingiva adapts to a wide range of shapes, clinicians today can create convenient interproximal shapes if the restorations are smooth and without a sharp-marginal ledge. Bridge abutments and exotic implant emergence profiles have aptly demonstrated this clinical reality. Restoratively driven papilla regeneration should become a viable option for all restorative dentists. Many aesthetic procedures that we routinely provide can actually improve the structural integrity of the tooth, and also facilitate better health of the surrounding gingiva. Diastema closure, at least in the anterior sextant, often fails to provide either of these secondary benefits. Sadly, the aesthetic diastema closure often results in significant compromises in the root/crown architecture. It can also contribute to increased plaque retention with subsequent deterioration in periodontal health. In addition, this is often followed by increased caries activity. Tables 2 and 3 highlight a magnification-based approach to the multiple factors that determine the gingival reaction to prosthetic and restorative intervention into the sulcus and pericrestal zones. One will observe that a bulbous contour is far less detrimental than other often ignored and clinically unseen factors2. Any discrepancy greater than 50 µm, will cause an untoward tissue response. If we are to «do no harm» when doing elective diastema closures, we must elevate our game5-7. Many adult orthodontic cases are undertaken to correct the problem of crowding. Often times, the «unraveling» of incisors will result in a dramatic improvement in the aesthetics of tooth position, but with the unfortunate side effect of blunted papillae. The dreaded black triangle (or gingival diastema) can be a source of significant patient dissatisfaction and even possible litigation. One option that has been frequently undertaken in the past is to retreat the case orthodontically. The affected teeth are aggressively stripped in the interproximal areas with lightning strips, or with a high-speed handpiece and diamond burs. The dental arches are then essentially «collapsed» to approximate the roots. Consequently, the interdental papillae are compressed. 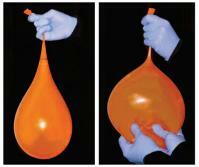 (Similar to the «water balloon effect» described earlier in the article.) Gradually, the papillae swell (or creep) incisally and engage the contact area. The downside of this method of treatment can be significant. Orthodontic retreatment is expensive, time consuming, requires multiple appointments, and can come with potential compromise in tooth position and arch size. The loss of tooth enamel when the contact areas are stripped can be significant and is irreversible. Porcelain laminate veneers, or full-coverage porcelain crowns, are a proven and successful solution. Occasionally, the act of tissue retraction, combined with the negative effects of the interim prosthesis, can negatively impact the outcome. The reaction of the papilla during this process can be unpredictable. In a worst case scenario, the black triangle remains, or even worsens. The potential also exists for papilla health to become compromised. Unsightly cyanotic and engorged tissues can be the end result. Masters of periodontal microsurgery (ie, Drs. Dennis Shanelec, Peter Nordland, and Adrianna McGregor) have demonstrated very acceptable outcomes from utilizing this exotic procedure. However, this incredibly «nuanced» procedure is really beyond the scope of most general and periodontal specialty practices. Until now, there were very few dedicated tools or techniques for restoratively-driven papilla regeneration. Previous attempts at both diastema closure and papilla regeneration using direct composites often ended with significant compromise in periodontal health. The interdental papilla serves as both an aesthetic and functional asset. Anatomically ideal interproximal composite shapes can serve as a predictable scaffold to regain this valuable gingival architecture. The reader is strongly cautioned that to attempt this elective procedure without using magnification and appropriate materials may not be in the patient’s best interest; nontreatment or referral would then be recommended. This extremely rounded, injection-molded-composite-filling technique is new. Once again, technological advancements allow us to perform techniques that were previously unthinkable. Slowly, the profession will change their thought patterns, retrain their hands and minds, and accept this clinical evolution in restorative dentistry. Hilgert LA, Lopes GC, Araujo E, et al. Adhesive procedures in daily practice: essential aspects. Compend Contin Educ Dent. 2008;29:208-215. Clark DJ, Kim J. Optimizing gingival esthetics: a microscopic perspective. Oral Health. 2006;96:116-126. Tarnow DP, Magner AW, Fletcher P. The effect of the distance from the contact point to the crest of bone on the presence or absence of the interproximal dental papilla. J Periodontol. 1992;63:995-996. Holmes CH. Morphology of the interdental papillae. J Periodontol. 1965;36:455-460. De Boever JA, De Boever AL, De Vree HM. Periodontal aspects of cementation: materials, technics and their biologic reactions. Rev Belge Med Dent. 1998;53:181-192. Sorensen SE, Larsen IB, Jorgensen KD. Gingival and alveolar bone reaction to marginal fit of subgingival crown margins. Scand J Dent Res. 1986;94:109-114. Sorensen JA. A rationale for comparison of plaque-retaining properties of crown systems. J Prosthet Dent. 1989;62:264-269. Dr. Clark has a financial interest in the patented Bioclear matrix system.